Enjoy the city's sights by night. 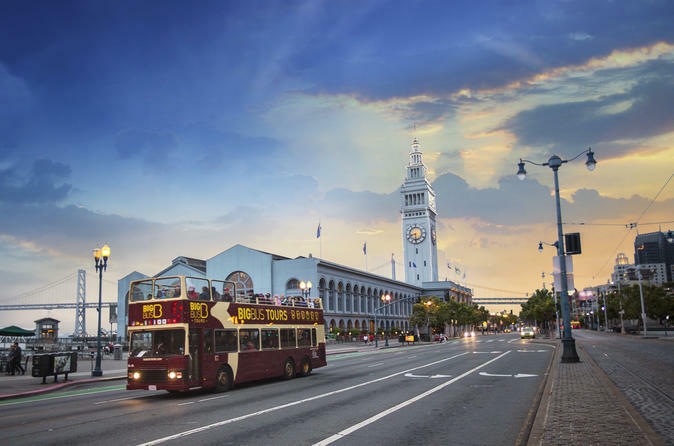 Beginning at Fisherman's Wharf, our Night Tour of San Francisco takes you through the evening vibrance of the Embarcadero, Fisherman's Wharf, Chinatown and the Financial District before crossing the Bay Bridge for photos at Treasure Island. Seats are available on a first-come, first-served basis, so please aim to arrive 20-30 minutes before your preferred tour time. Please note that this is not a hop-on, hop-off tour. See San Francisco at night on a bus tour starting and ending at Fisherman’s Wharf. See the city by the bay's top sights including Embarcadero, Fisherman's Wharf and Chinatown, among others. Bonus: Take the Bay Bridge to Treasure Island, where on a fog-free night you get a picture-perfect view of the twinkling cityscape. Operates: Daily at 6:30pm, 7:00pm and (7:30pm April – October) No tours on Dec 24th and Dec 31st. At the end of the Night Tour a courtesy shuttle is provided back to Union Square. Seats are available on a first-come, first-served basis, so please aim to arrive 20-30 minutes before your preferred tour time. Please note that this is not a hop-on, hop-off tour. Your tour lasts 60-90 minutes depending on traffic.